“I commend to you our sister Phoebe, a deacon of the church at Cenchreae, so that you may welcome her in the Lord as is fitting for the saints, and help her in whatever she may require from you, for she has been a benefactor of many and of myself as well.” (Romans 16:1-2). Phoebe is the first recognized women deacon of the Catholic Church and is named in Paul’s Letter to the Romans found in the New Testament. She may be the first woman deacon but she is certainly not the last. This past spring a group of St. Agnes parishioners and members of the Ignatian Spiritual Life Center community met to study the history and future of women deacons by reading the book Women Deacons: Past, Present, Future. This letter is a product of our study and prayer. It includes our discoveries, insights, and hopes regarding the topic of restoring the diaconate for women in the Roman Catholic Church. 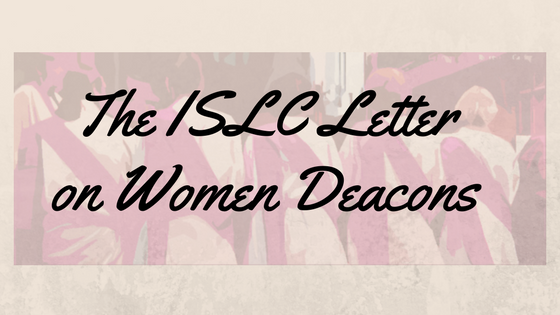 Our hope is that this letter will inform our community, inspire continued conversation, and give space for ongoing questions regarding women deacons. Women deacons are a part of the history of our Church and are part of our Catholic tradition. Their ministries began in the time of the early Christians and lasted well into the twelfth century. The presence of women deacons in the Catholic tradition spans half of our history as a Church community. Although there were various periods of time when the structural church condemned women deacons, there were equally times when hierarchical support for women's ordination to the diaconate flourished. In the early years of the Church the Church Fathers attempted to abolish women deacons, but instead their ministry grew. It is indisputable that women served as deacons, but what did women deacons do? That depends on when and where they lived. The ministries of women deacons through history range from assisting with the sacraments of initiation, preaching, leading communal prayer, and a multitude of ministries of charity. Were women deacons ordained? We have discovered more appropriate questions might be; what does ordaition mean? And what are our hopes for ordination in the Catholic Church? In the early Church, ordination was about a call from the community to provide a needed work or service , not a "power" bestowed upon someone. With this in mind, the lack of access to the diaconate for women seems to be a reflection of historical and societal conditions rather than of theology. Women who have been called by their communities to serve as preachers, presiders, and ministers of the Church for centuries should be called deacons. The diaconate should be about vocation and ministerial identity rather than the scarcity of vocations or following long-disputed laws. It is about the call of the community. Our community’s hopes for ordination in our Church include: the ordination of women deacons, a decrease in clericalism, open-mindedness to new understandings of priesthood, and a more authentic honoring and expression of all gifts of all people called to ordained ministry. Through prayer and group discernment the Ignatian Spiritual Life Center community has concluded that the ministry of women deacons already exists in our community and in the Church around the world. Now it is time to officially restore the diaconate for women. How would the Church benefit from the restoration of women to the diaconate? The ordination of women is a resource of love and support and service that our church needs. Women deacons would bring new life to the Catholic Church. In a global world that is rapidly changing we need a new perspective. Being bold enough to make such a beautiful and significant change to the Roman Catholic Church would mark a monumental step in shifting the global narrative on women’s rights and the human dignity of women. We need women who are passionate and compassionate to shed light on the plight of the marginalized around the world. Who better to deal with contemporary crisis than those women who have been preparing and waiting for the day when their incredible intellect and love are allowed to lead? It would benefit the Church on a large scale, as it would integrate women into more decision making bodies of the structural Church. Having women on the altar will change the way the people of God see themselves. Women will see in a new tangible way that they too are the face of Christ, and all people will see that Jesus calls everyone regardless of gender to ordained ministry. It will break open centuries old clerical attitudes and enliven the people of God with possibilities; the possibility that each one of us is called to be like Jesus rather than a select group. We would be returning to part of our tradition born at the birth of our Church. Women will bring an abundance of gifts including compassionate leadership, preaching, presiding, and pastoral care. Women are ready to share these gifts. Women have been waiting in darkness, but it is the darkness of the womb. Women have been growing in this loving darkness preparing to come into the world to make it new and full of light. ​At the Ignatian Spiritual Life Center it is our commitment to support women called to the diaconate. These women who have graced us with their loving presence and dedication to ministry need the support of our community. We are committed to continued study, prayer, and conversation regarding women deacons. Lastly, we are committed to honoring the pastoral and liturgical gifts of women now by supporting a monthly liturgy where women are invited to preach and preside starting this fall. We believe in the restoration of the women's diaconate as an important part of the future of our Church.